Let’s be frank: a table for 17 is a pain in the arse in this city. A) Specialty menus and pairings mean you get a legitimate taste of what the kitchen — and cellar — can bring to the table; and B) it makes things easy: no pushy time limits, no waiting on that notoriously late buddy to seat the lot of you. 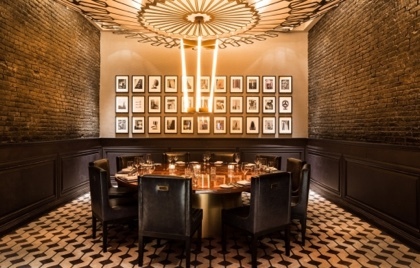 NYC’s crawling with backrooms — just ask booking service Private Dining Concierge. So the next time you find yourself in a 16+ situation, try one of the four superlative options below. Tucked away next to their LES eatery Louie & Chan, David Wiesner and wife Nicole Delacratz-Wiesner have pumped some life into the art of downtown dining at Louie. The evening offers a seasonal, customized prix-fixe menu alongside a tailored selection of Louie & Chan’s grand reserve wine. After dinner, retire downstairs to the lounge and loosen your tie a bit. Try a Chan’s Tonic and prepare the crew for some dancing next door at The 303. Book here. Only through October and not to be missed. Go with a group of 20 or rally a few pals for their communal dining offering. Expect a toothsome celebration of all things Aegean. Chef Rachel Goulet serves up 10 dishes over five courses, complete with regional wine pairings. And when they say family style, they mean it. Patrons are encouraged to sip on Greek moonshine passed ‘round the table and post up in the kitchen for a chat with Sommelier Frankie Mace. Book here. 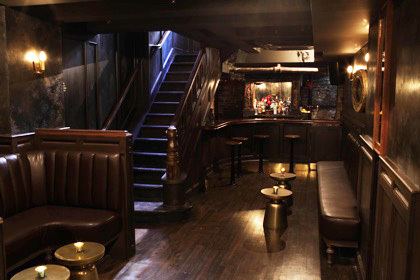 LDV Hospitality and Iron Chef Marc Forgione’s handsome Tribeca chop shop holds two exclusive spaces that perfectly complement the flashy main room. Seated dinner or à la carte options are available with the bonus of a private bar. It’ll make for a very New York night to remember with a price tag you won’t forget. Book here. One of the many secrets of the swanky 21 Club, a Prohibition Era landmark whose creed is “sit at the bar long enough and everyone in the world will pass by.” Unless, of course, you’re dining in the dapper wine cellar, a former speakeasy — a real one, not a Brooklyn parody. A special consult with Chef Erik Blauberg yields custom cuisine, so no two experiences will be the same. Book here.